African flags, and flags generally, are not just mere pieces of cloth materials with colours and designs on them. They are the identity of every nation. They further represent one or two things about the country. Over time, some countries see the need to make some adjustments in their national flags. The colours and symbols of many national flags carry cultural, political, and regional meanings and ideals. 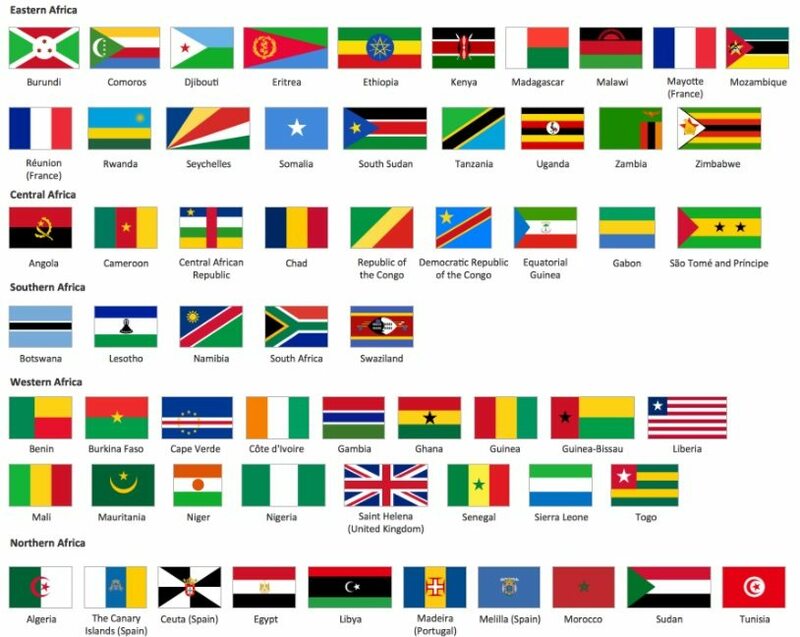 Most African flags bear a design, colour or symbol of the fight for freedom. National flags are respected to the core. A slight on the national flag is a slight on the entire country and the heroes whose blood earned these countries the freedom and independence they enjoy. That is why they are saluted and displayed at institutions and during several national and international occasions. Even when they are ripped and worn, they are not carelessly destroyed. There is a step by step guide to how to dispose of them in a special ceremony as is the case with the US flag. 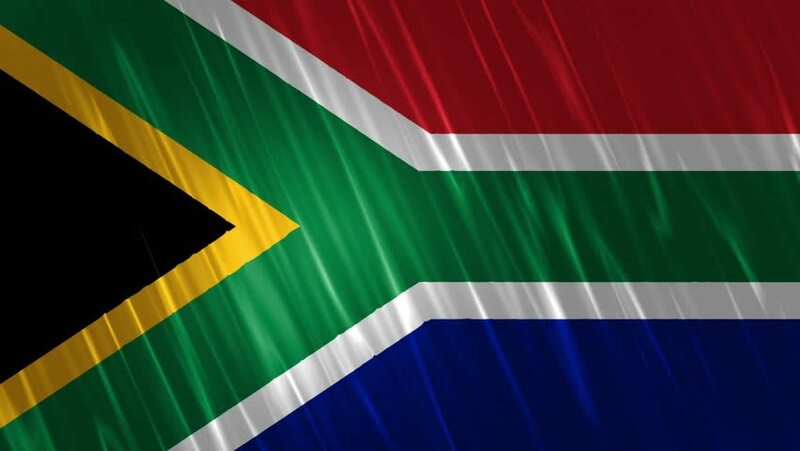 The South African flag was first raised and officially adopted on April 27, 1994, after their independence and the swearing-in of Nelson Mandela. The flag was and is a sign of freedom and hope for the long over-due oppressed nation. As a direct influence of Madiba, the horizontal Y shape in the flag represents the unity in diversity concept of the country. The South African flag also shares some details with the ACN banner. 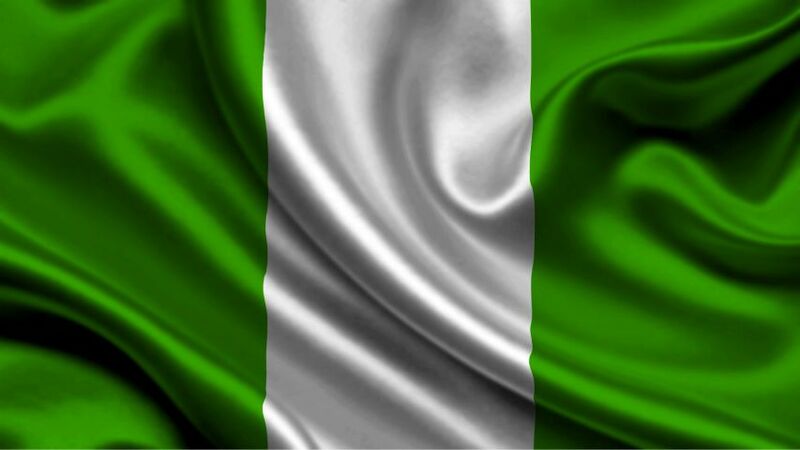 The green-white-green flag was designed by 23-year-old Nigerian studying in London, Michael Taiwo Akinkunmi, in 1959 and was officially raised in 1960, after the country’s independence. The green colour stands for the nations’ immense natural endowments (resources) and white represents peace. 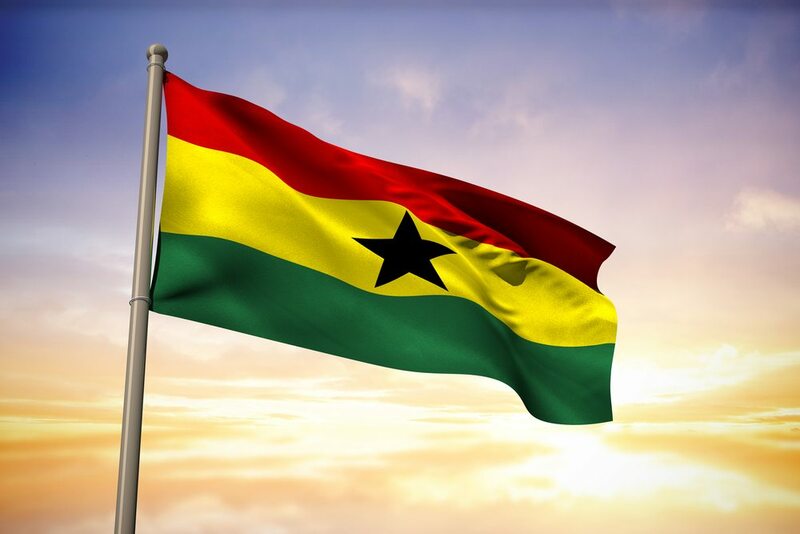 Designed by Theodosia Okoh, and adopted in 1957, the current Ghanaian flag was one of the African flags to use the Pan African colours – red, yellow, and green. The red-yellow-green colours arranged horizontally represents those who died for the nation’s independence; the gold/mineral resources; and the country’s natural wealth respectively. The black star which was inspired by Marcus Garvey’s Black Star Line (shipping line) symbolizes African emancipation. 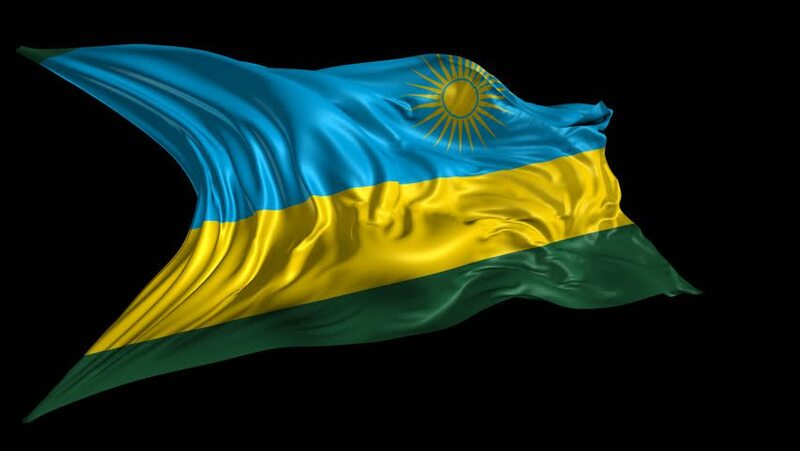 The Rwandan flag was designed by Alphonse Kirimobenecyo and adopted on October 25, 2001. This was not always the original national flag. It was replaced in order to eliminate the aura of the 1994 genocide. There are 4 different colours on the flag – Blue, 2 different shades of yellow and green. Blue represents joy and peace; yellow represents the economic potentials; the sun yellow represents enlightenment, and green represents prosperity. As a whole, the flag upholds “national unity, respect for work, heroism, and confidence in the future” (Wikipedia). 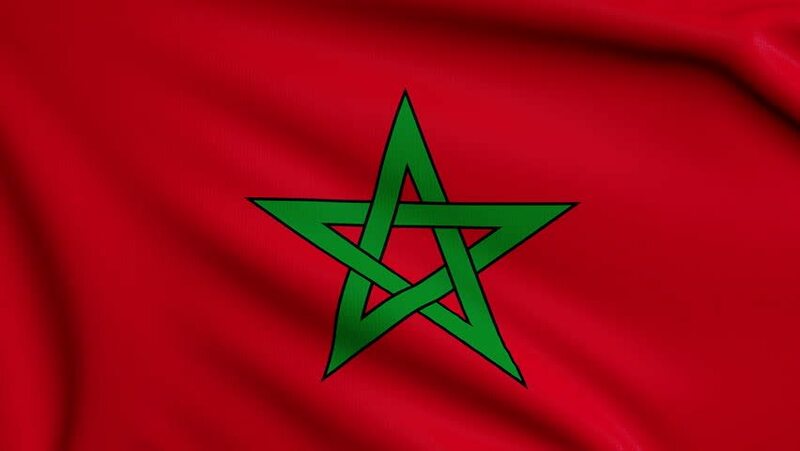 Morocco won their independence on 2nd March 1956 but the current national flag was restored in 1955. It is widely believed that the red colour represents bravery while the 5 pointed star (pentagram) represents Solomon seal. The Islamic-green coloured pentagram was included in the flag design under the administration of Mulay Yusuf in 1915. 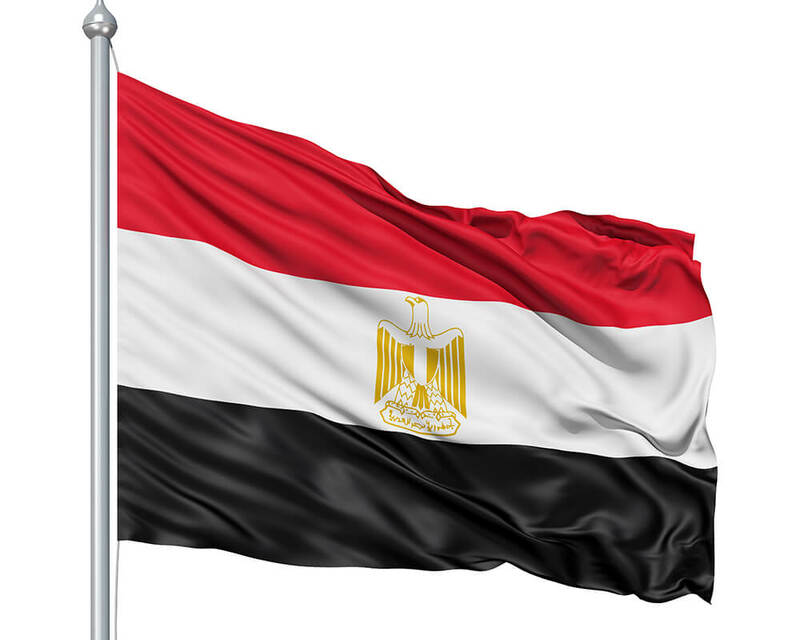 The Egyptian Flag has undergone about 7 modifications in its history. Each version represented a significant time in the history of the Arab nation. Consisting of equal horizontal red, white, and black bands with the nation’s emblem (Eagle of Saladin) on it, the current flag was introduced in 1984. Red symbolizes the period of struggle before the Revolution; white symbolizes the non-violent revolution while black symbolizes the end of the imperialist’s subjugation in Egypt. The Zimbabwean flag contains 5 colours – Green, gold, red, black and white. On the left-hand side of the flag is a white triangle which symbolizes peace. On the triangle is a fusion of a red 5-pointed star and a bird in its centre. The Zimbabwe Bird has always been a prominent part of the several versions of the national flag since 1968. It is the national symbol of Zimbabwe. On the other part, the flag has seven even horizontal stripes of green, gold (yellow), red and black. White stands for peace; green for agriculture; yellow for mineral wealth; red for the lives lost during the fight for freedom; black for the African heritage. The current Seychelles flag is the third national ensign to be used by the country since independence on June 29, 1976. The flag was officially adopted on January 8, 1996. It is characterized by 5 diagonal colours which represent the colours of the country’s major political parties as well as the anticipated dynamics and prospects of the country’s future during her struggle for independence. 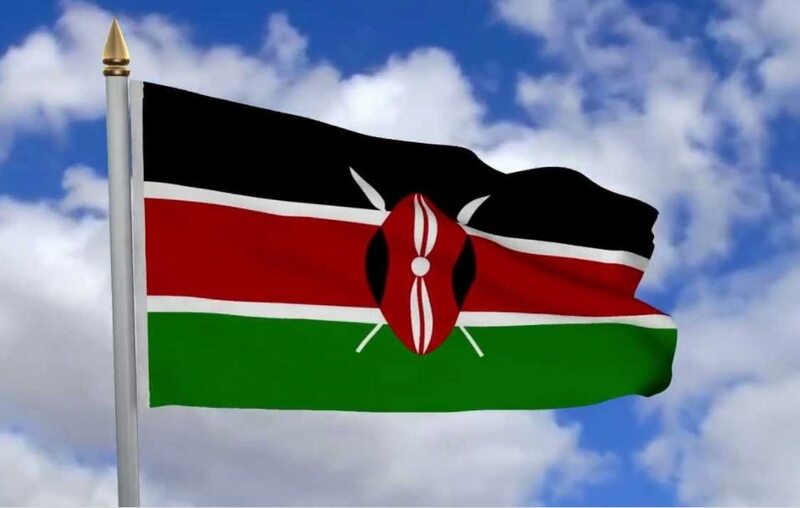 The Kenyan flag was adopted on December 12, 1963. Black represents the Kenyan people; red for the bloody fight for independence; and green for the country’s landscape and natural wealth. The white fimbriation symbolizes peace and honesty. At the centre of the flag is the image of a tricolour (black, red, and white) traditional Maasai shield and two spears which represent defence. 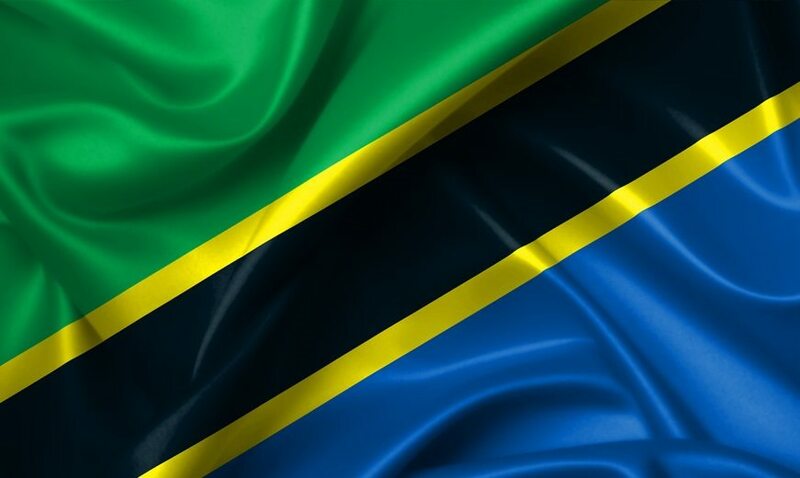 The green colour represents natural wealth of the country; black represents the native Swahili people of Tanzania; blue symbolizes the Indian Ocean and the nation’s water bodies; the thin stripes of yellow stands for Tanzania’s mineral wealth. The Ugandan flag has six equal horizontal bands of black, yellow, red, black, yellow, and red from top to bottom respectively. In the middle is a white disc with a grey-crowned crane, facing the hoist side. The black band represents the African people, the yellow represents the sun that shines on the continent while the red signifies brotherhood (blood). The grey-crowned crane was the colonial badge of the Ugandan military. Cameroon was the second state to use the Pan African colors in its national flag. It was adopted on 20 May 1975 after Cameroon became a unitary state. 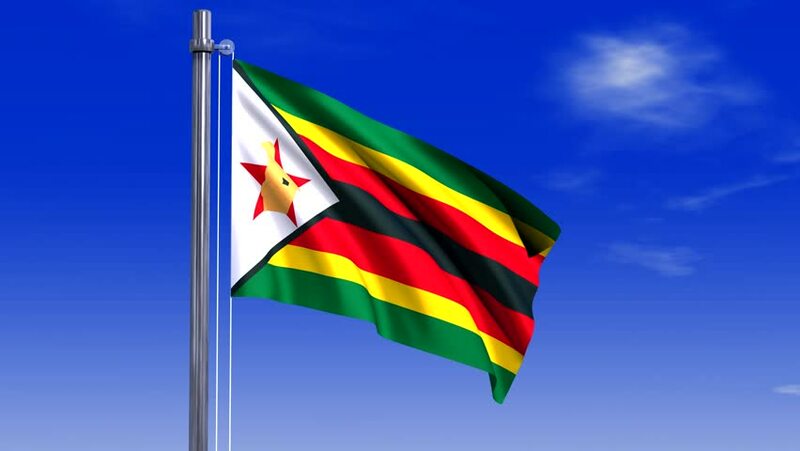 For a change the red on the flag stands for unity; yellow for the sun/savanna; a star for unity as well; and green for natural wealth. The red represents the sun/savanna grasslands and the nation’s nearness to the Equator; blue for the River Gambia and green for the country’s vegetation and natural wealth. The Somalian flag is one of the most simple African flags with a plain blue field and a white 5-pointed star – the star of unity – at the centre. It was designed by Mohammed Awale Liban and adopted on October 12, 1954. It was created in 1954 during the transitional trusteeship period of the nation’s history. The blue field was inspired by the United Nations’ flag. The star symbolizes the 5 places where the Somali race is found – Djibouti, Ethiopia, Kenya and the former British and Italian colonies. This is the first and only flag of the former French colony. It was designed in 1958 and adopted on December 3, 1959, after the people voted in the favour of a referendum to become an independent republic. The flag was not in official use until their full independence from France on August 7, 1960. Inspired by the French Tricolore, the orange shade represents the savanna grasslands/fertility; green represents the coastal forests/hope; while white is symbolic of the country’s rivers/peace. The Angolan flag came into official use when they won their independence on November 11, 1975. It is divided into 2 horizontal upper red and lower black parts with an emblem at the centre. The emblem consists of a golden star, part of a cog wheel and a machete. It symbolizes industrial and agricultural workers. The yellow colour represents the country’s mineral wealth; while the red and black colours are believed to represent freedom or death. Two horizontal bands of red and green with a white vertical band on the hoist side. The flag colours were inspired by the flag of the last Merina monarch, Queen Ranavalona III. Red and white were the colours of the Merina kingdom – a pre-colonial state off the coast of Southeast Africa. Green represents Hova – the largest class castes and peasant commoners who played a significant role in the fight for independence. 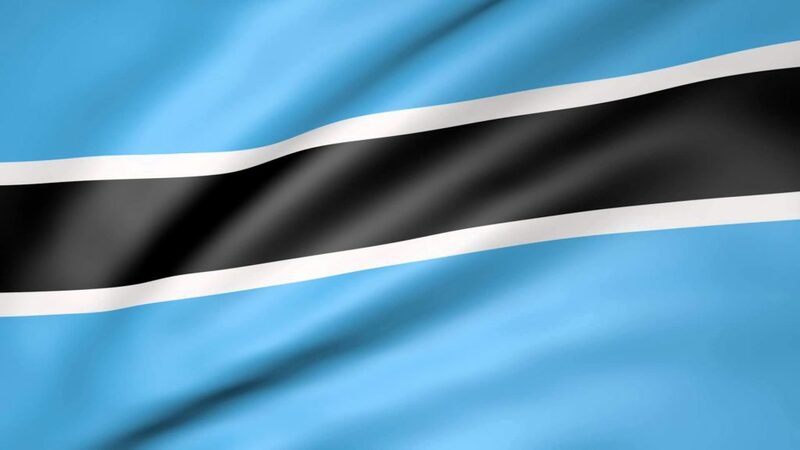 Botswana used the UK flag as a protectorate till their independence on September 30, 1966. The flag is credited for being one of the African flags that did not take its meaning from the leading political party. Instead, the flag designs and colours give cultural, political, and regional interpretations. The blue represents water while the white-black-white band represents pluralism/racial harmony. It is also said to represent the stripes of the zebra which is the national animal of Botswana. The current flag of Mauritania was adopted after a referendum on 5 August 2017. President Mohamed Ould Abdel Aziz had scheduled a referendum for the modification of the flag. He proposes that 2 horizontal red bands be added to the upper and lower parts of the flag. This will represent the lives and sacrifices made for the country. The former flag which was adopted on April 1, 1959 was without the red bands. It had a green field and an Islamic crescent and star symbols. The 2 colours – green and gold – stand for Pan-African ideals. It was noted as one of the African flags that is void of Africa’s most used colours – red, white or blue but now, we cant say that anymore. The green is said to represent Islam which is the major religion in the country. It also stands for a bright future, and growth.